Mending Matters- Mending Matters explores sewing on two levels: First, it includes more than 20 hands-on projects that showcase current trends in visible mending that are edgy, modern, and bold—but draw on traditional stitching. It does all this through just four very simple mending techniques: exterior patches, interior patches, slow stitches, darning, and weaving. In addition, the book addresses the way mending leads to a more mindful relationship to fashion and to overall well-being. 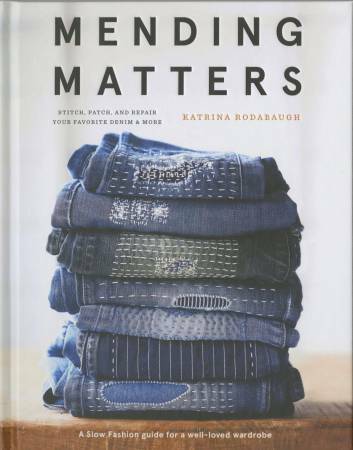 In essays that accompany each how-to chapter, Katrina Rodabaugh explores mending as a metaphor for appreciating our own naturally flawed selves, and she examines the ways in which mending teaches us new skills, self-reliance, and confidence, all gained from making things with our own hands.